It aligns with your industry. It provides a tailored experience. Editor’s note: This post was originally published on 2/23/16 and has been updated for accuracy and comprehension. 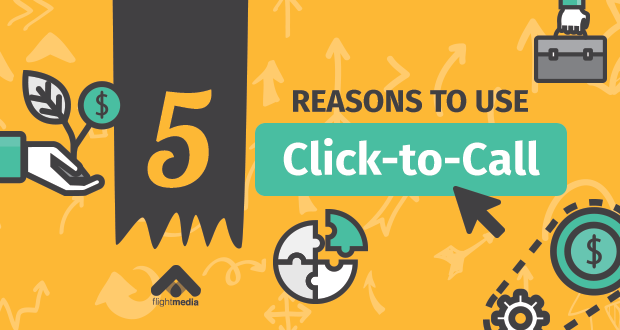 Have you ever considered adding a Click-To-Call button on your website? If not, you should. 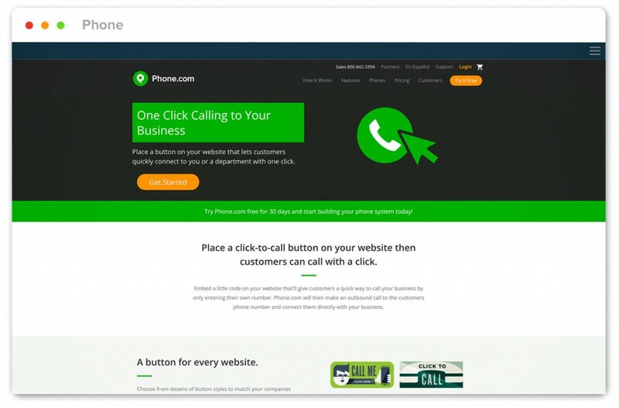 88% of visitors are more likely to contact your company if you provide a “click-to-call” button on your website. So, why aren’t more businesses utilizing this option when the conversion statistics are clearly evident? Perhaps they don’t know about this stat. Now that you know how powerful it is, find out why your business needs a click-to-call service in 2016. You may believe that consumers no longer use the phone. But nothing could be further from the truth. It’s easy to forget about the power of connecting with customers through simple conversation devices like click-to-call since the average business owner is usually focused on selling products, services and communication online. Before making a purchase, customers often want access to more information – and quickly. The click-to-call feature is a link on the page that brings up your phone number and the option to call your business once a user clicks on it. Users who choose to call are what I like to refer to as “ready-to-buy” consumers. They’re the best kind, too! 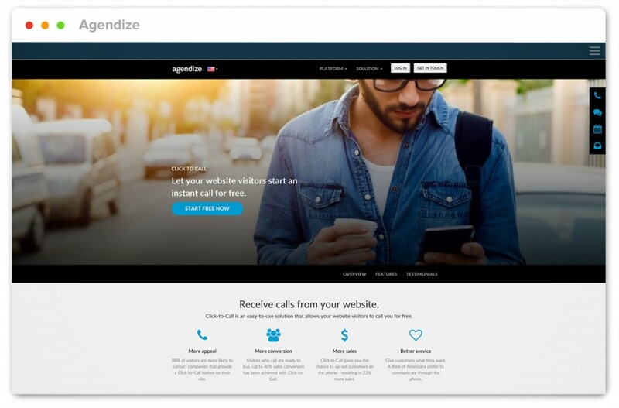 Studies show that adding a single click-to-call call-to-action led to a 200% increase in call-to-conversion rate. Now that’s a number worth pursuing! Click-to-call gives your business the chance to up-sell consumers on the phone, which, according to studies, can result in 23% more sales overall. Even having a phone number prominently displayed on your website contributes to overall higher conversions. If you want to capture your leads while they’re hot, listen up! When users click-to-call from your website or mobile, they’re ripe to buy and looking for answers. Capture them immediately by using a click-to-call button and your sales and revenue are sure to skyrocket. #2: It’ll Enhance Mobile Use. Capturing mobile users means that your business needs to implement what works best for the customer of today on that given platform. Did you know that 70% of mobile searches result in a phone call? If in fact you’re looking to design a website or have a face lift, you won’t want to overlook these statistics – even if they're slightly intimidating! Adapting to your users’ needs for mobile isn’t just important, it’s essential to increasing your traffic, user performance, and revenue. 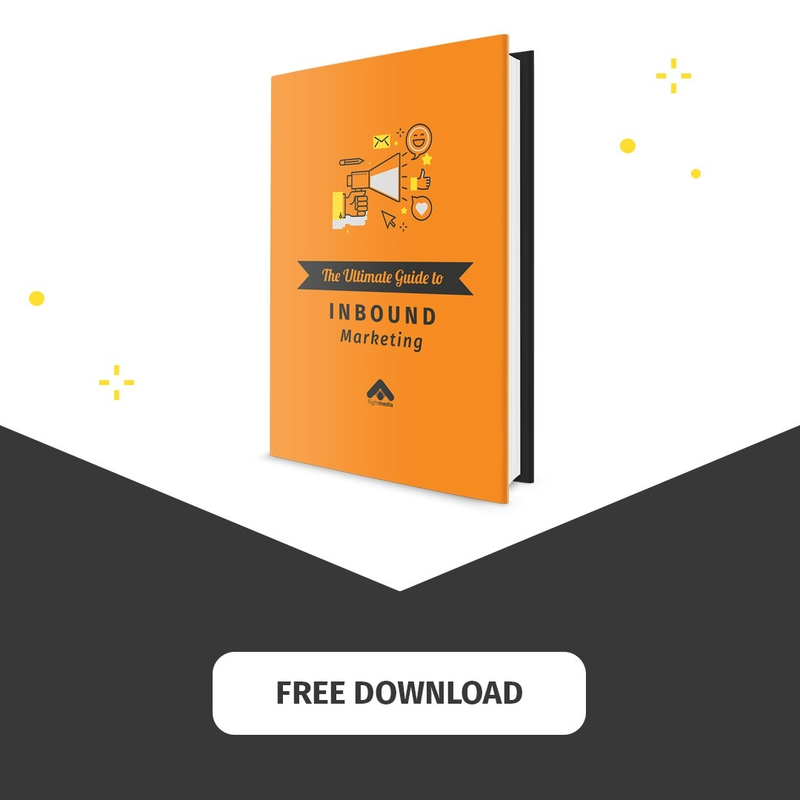 #3: It’ll Align With Your Industry. Knowing your target audience and understanding its purchasing behavior can determine whether a click-to-call CTA is favorable for your business. Pro-Tip: Providing a click-to-call button on your website and mobile device is an undeniable way to reach Millennials (ages 21-34). Millennials are eager to connect directly with your business -- their spending habits account for more than $1.3 trillion annually! You can’t deny wanting to tap into that market. #4: It’ll Save You Money. Strengthening your customer service and adapting your website to meet the needs of your users is the single most important focus for your business. For example, 64% of customers become frustrated if they visit a website that doesn’t list a phone number. In fact, conversions decrease when the website doesn’t have the business’ phone number present and visible. If you only offer customers the option to fill out a form to contact you, you’re actually discouraging communication that could lead to a sale and offering poor customer service. On the other hand, your target audience will click on the click-to-call button if it is available and visible, no matter the device they’re using. Click-to-call services have proven to have a high ROI and the statistics support this notion. Another bonus: click-to-call rates are considerably lower than acquiring a toll-free number. #5: It’ll Provide a Tailored Experience. Whether it’s through mobile or desktop, your customers want the same experience. 9 out of 10 consumers expect to receive a consistent experience over multiple contact channels. 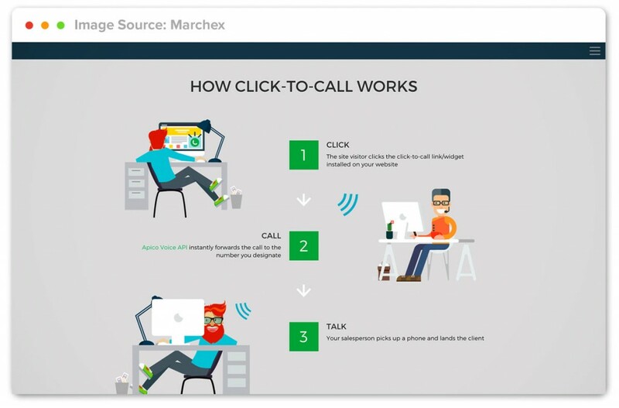 A click-to-call call-to-action lets customers experience the same service on a desktop as they do on a mobile device. This is done by transmitting telephone calls over an IP network such as the internet (VoIP). Your users need a smooth, streamlined process for actions like making a purchase on your website, filling out a form, or contacting your office. Here's a round-up of four bite-sized click-to-call services that show the desktop experience. “Click-to-call” service is a sure way to engage your audience and stay on top of customer service. However - don’t get caught with your pants down! Having a button for your users to click means they’re going to click it. You (or your sales team) need to be ready to accommodate the 20% increase in calls. Consider your industry. Invest in click-to-call if you’re in an industry where consumers are more likely to use it. It provides immediate feedback. Your consumers need to receive immediate customer service from your business. Meet your audience’s expectations by providing a quick and seamless entry point to get in touch. It’s mobile friendly. If you use it, consumers will click it! 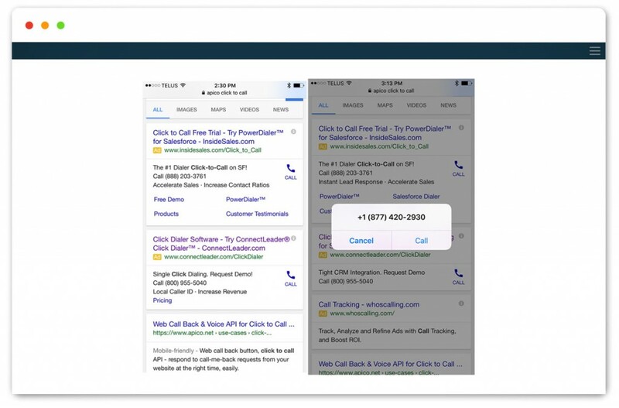 Placing a “click-to-call” option for mobile increases conversions by 200%. 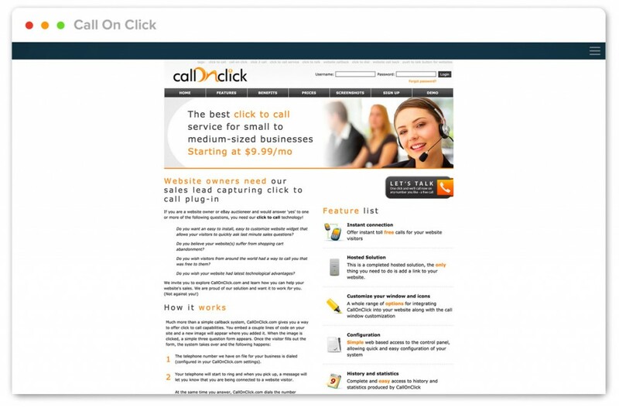 Are you using a click-to-call service? If not, are you now convinced you should be?